Farmgirl Fare: Announcing The Food Blog Awards 2008! It's that time again, when you get to nominate, vote on, and discover delicious food blogs. 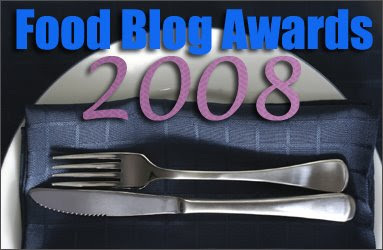 Nominations for the Well Fed Network's 2008 Food Blog Awards are going on now, and anyone can nominate their favorite food blogs. You'll find all the rules here, and can meet the judges here. Here's how it works: You have until Friday, January 9th at 11:59 p.m. EST to nominate your favorite food and drink blogs. A blog needs just one nomination to be entered. The amount of times a blog is nominated has no bearing on if it is chosen for a Top 5 Nominees position. The panel of judges will choose the Top 5 Nominees in each category, and then the polls will be open for voting at Well Fed from January 19th through January 23rd. There are 14 Food Blog Award categories this year, including Best Rural Food Blog, which we were thrilled to win in 2006 and 2007. This is a fun competition and a wonderful way to share and discover some of the most scrumptious food blogs out there. So go forth and nominate, have fun, and then go back and vote! © Copyright 2009 FarmgirlFare.com, the foodie farm blog where the animals don't really care all that much about awards, but some of us are busy trying to figure out which blogs we want to nominate this year. So many tasty food blogs, so few meals in each day! wooden bowls with some worm holes". Isn't this the kind of bowl I would want to use as a dough bowl??? You don't want a finish on it right? Thanks! Thanks for letting us know about the Blog Awards nominations. I love visiting your blog, your adorable photos, and your fabulous recipes. I hope someday you tell us about your pureed carrot muffins? Hello! New to your site! I made your beer bread lastnight- FANTASTIC! That's correct - if you're going to use your wooden bowl for mixing/rising bread dough (or any other food), you don't want it to be painted, stained, etc. An old bowl needs to be cleaned really well before using, then give it a light coat of an oil that it is edible and won't go rancid at room temperature, such as mineral oil or almond oil. If the wood gets too dry it will crack. Another option is to buy a new wooden bowl from one of the companies still producing them, such as The Bowl Mill. Do a google (or froogle.com) search for things like 'wooden dough bowl' or 'wooden bowl manufacturer' and you'll find others. Hope this helps! Welcome to the farm! So glad you enjoyed the beer bread.